The new year 2019 has brought with it not just new beginnings, but tons of new hot tubs as well! In this article, we are reviewing some of the best inflatable hot tubs to come out this year. 1. 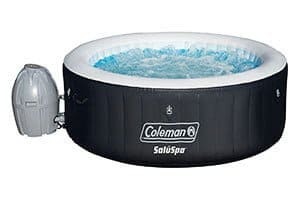 Coleman Lay-Z Spa: Best Inflatable Hot Tub? How to Choose the Ultimate Inflatable Hot Tub for You? How do I set up my jacuzzi? What chemicals can I use for my water and how? When should you change the water? What if it has a hole? Can they be used in the winter? How cheaper is it compared to a regular hot tub? Are children safe to use it? Can you put a jacuzzi indoors? 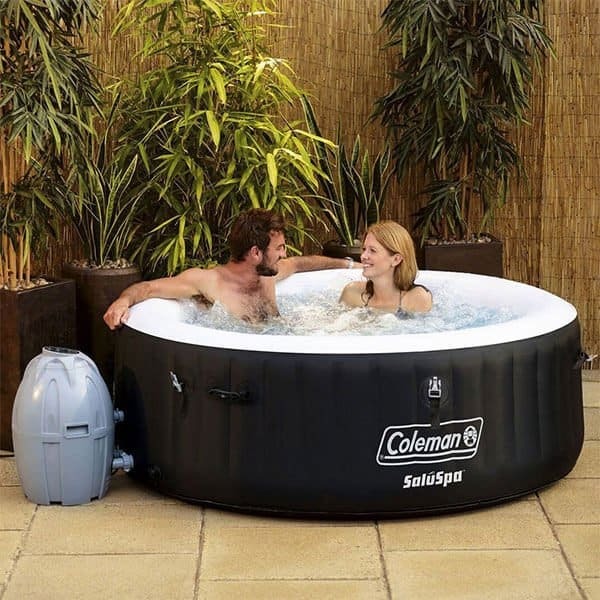 Coming from the Coleman line of spas, the Coleman SaluSpa is a worthy bubble massage alternative to the Lay-Z Spa if it ever goes out of stock. ​The Coleman Lay-Z Spa is worth every single dime. It’s one of the items we have reviewed that I highly recommend, especially for first-time buyers of outdoor spa. 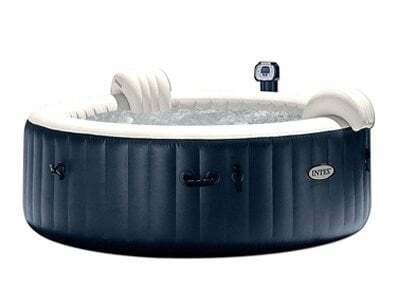 While this hefty Intex portable bubble massage spa set is priced a bit higher than some of its competitors, it’s worth every dime if you’re a large, spa-loving, family. Coleman is a renowned brand in the outdoor utility industry and known particularly for producing quality tents and coolers. However, they are also involved in manufacturing other products such as mobile spa units. 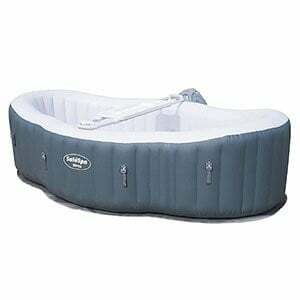 One of their best sellers is the Coleman Lay-Z Spa Inflatable Tub. 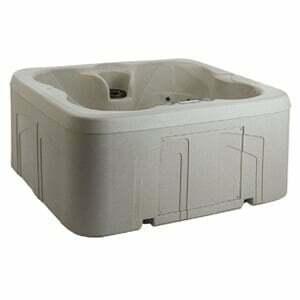 This tub offers great value for money in the under $500 outdoor hot tub category. It can seat up to six people at a time and let them pamper themselves surrounded by relaxing bubble jets. One of its best selling points is its ability to retain its water temperature for a longer period of time. Its heating unit warms the water at two degrees Fahrenheit per hour and can reach up to 104°F. This means it takes about a day before the unit reaches its hottest temperature. 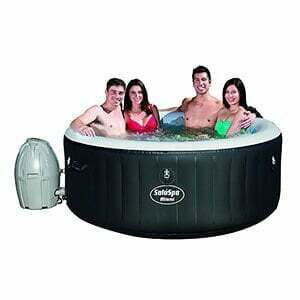 The Lay-Z Spa Coleman inflatable hot tub also comes with the right amount of bubble jets that provides a mild massage. Its engine also does not produce any noise and runs as quiet as a whisper. The unit is easy to set up and inflates easily via its own pump. Thus, installing the unit to your own backyard requires no tools. 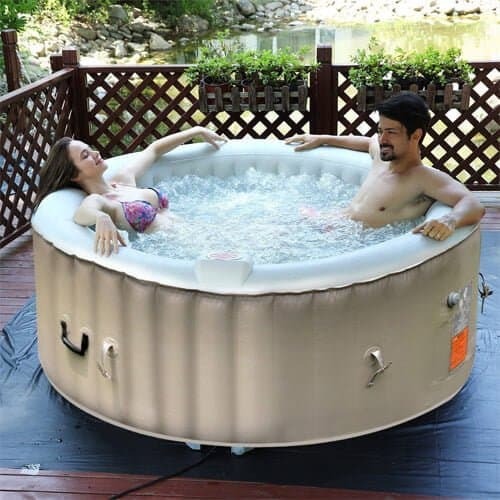 When fully inflated, the hot tub has a diameter of 77-inches, which is enough to give all bathers a great seating position with extra legroom. The package also contains a DVD instructional material which provides a step-by-step guide on how to properly install the unit. This is quite useful for the first time buyers as it speeds up the installation process significantly. Comfort is also another one of its best selling features. 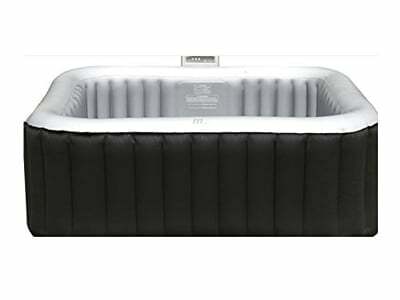 It’s designed with a layer of air pad cushioned flooring underneath the spa which gives additional relief to the user. This feature also minimizes heat loss and helps insulate the inflatable spa to keep its current temperature. Enjoy full relaxation after a tiring week! Every operation about the Coleman inflatable hot tub can be managed via a digital control panel. It also comes with a start-stop timer which automatically turns on or off when the unit reached the temperature you previously set. As such, you don’t need to constantly monitor if the water is warm enough or not. These are just some of the features that help it made our list of the finest inflatable hot tub for this year. 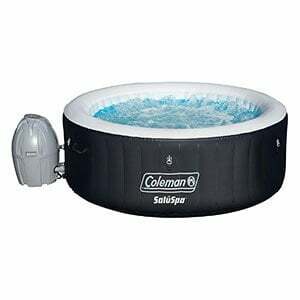 The Coleman inflatable hot tub "Lay-Z Spa" is also quite durable and is built to last. It’s made of three-ply reinforced polyester mesh and PVC layers that don’t crumble easily. 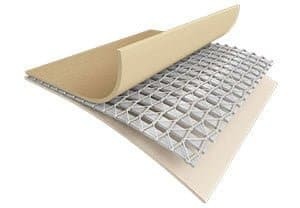 Moreover, it’s structurally tough because of its i-beam construction that prevents bending or buckling. Because of this, it can carry a load of up 2,701 lbs when completely filled with water and bathers. Additionally, this mobile spa weighs less than most of its competitors. As such, you can move it around while grabbing on its secure handles. Also, you can also install it indoors as it only needs a structure that supports 67 lbs per square foot. An inexpensive inflatable spa is perhaps one of the best recreational investments you can have today. 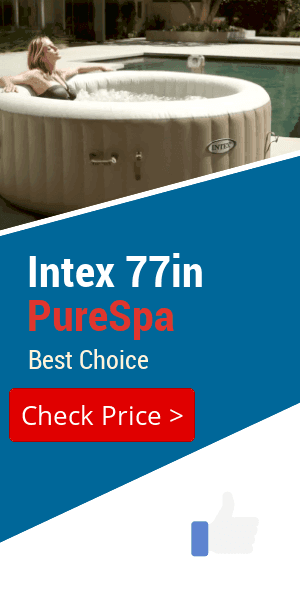 The Intex PureSpa Bubble Massage is one of the best tubs that can help you make the habit of washing away your aches and pains through a warm bath. 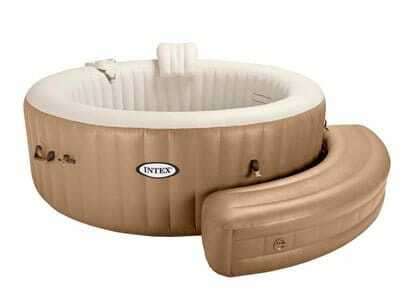 This four-seater Intex inflatable spa can give you a massage that is comparable to the more expensive systems around. It has a hard water treatment system that softens the water to ensure a great bubble bath. Thus, helping you unwind and relieve stress while softening your skin. You can also set the mood of your bath by changing the color of the tub’s water through its built-in LED lights. Whether you like a sultry mood or a party atmosphere, you can change the tub’s ambiance. You can manage every operation involving the hot tub via its easy-to-reach control panel. Everything from the water temperature to switching on or off its other functions is just a button away. This one comes with an intuitive panel. 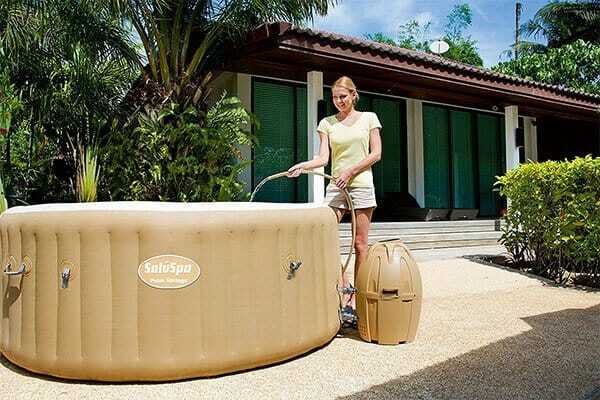 One of the best qualities of this outdoor inflatable spa is its ability to retain heat for a long period of time. It has a decent temperature range of 68 to 104 degrees Fahrenheit. Its heating unit can maintain the temperature you set even if you use its bubble function or left it covered. 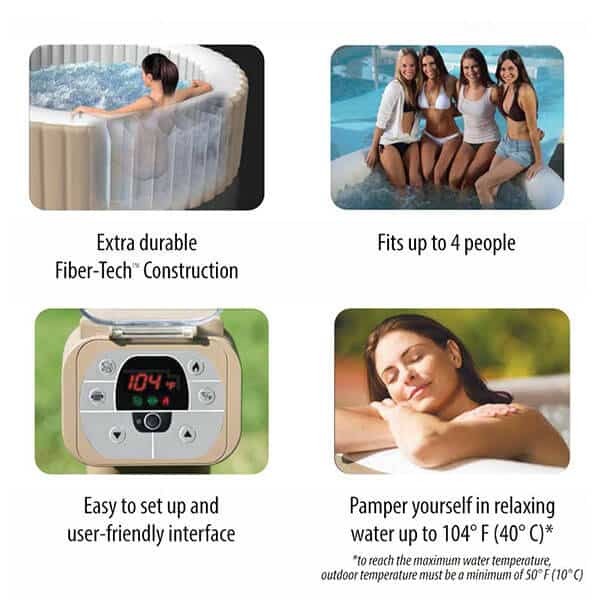 This Intex PureSpa also warms up the water at a rate of 2 to 3 degrees Fahrenheit per hour. That’s a degree faster than most of its competitors. As such, it only takes less than a day for the Intex inflatable hot tub "PureSpa" unit to reach its maximum temperature which is great especially when the weather is cold. However, the manufacturer doesn’t recommend it for outdoor use during the winter months. The Intex PureSpa's heat retention feature and water flow are great not only because it keeps that soothing water warm, but also because it helps decrease electric consumption. It’s a feature that many cost-conscious household owners would surely love. Aside from having many features geared for the user’s comfort, you can’t also dismiss the portable hot tub’s ergonomic design. Every part of the Intex PureSpa is simply there to offer both comfort and functionality. Enjoy maximum relaxation with the SaluSpa's ergonomic design. 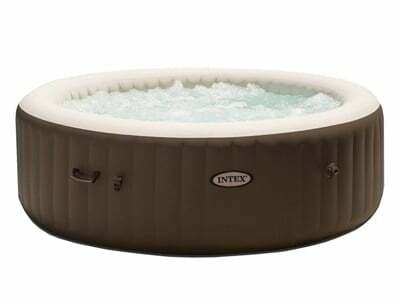 When fully inflated the Intex PureSpa has a diameter of 77-inches which gives its bathers a good seating position and enough legroom. The beauty of this feature is that it doesn’t consume much space compared to larger inflatable and non-portable Intex hot tubs. As such you can place it even in your patio or a patch of grass in your backyard. Moreover, this Intex PureSpa is also built from durable materials, particularly high-strength polyester fibers which do not stretch over time. As such, you can expect it to be firm and not easily deflate when left unused. Maintaining the quality of the Intex PureSpa's water is also a cinch thanks to its own chlorine dispenser. Protip: If you notice chlorine smell, add more chlorine (yes, you read that right)! A few test strips are also included in the hot tub package, so you can right away check the water quality after you have fully installed the tub. It also uses cheap and replaceable filter cartridges that can help you save a lot of money. Lastly, the Intex PureSpa is easy to set up and has an efficient inflation hose that helps the pump fully inflate the unit in as little as less than an hour. Additionally, the built-in pump also allows fast drainage of water at almost the same rate which is quite useful when you want to tuck it away fast. These feats are good enough for it to land on our list of the top inflatable hot tub from Intex for this year. When it comes to innovation, SaluSpa seems to be ahead of the curve of its competition. They offer some of the most technologically advanced units in the market. Every hot tub they have always had the latest technology available and are nothing short of revolutionary. To say the least, they have occupied at least half of our inflatable hot tub list. 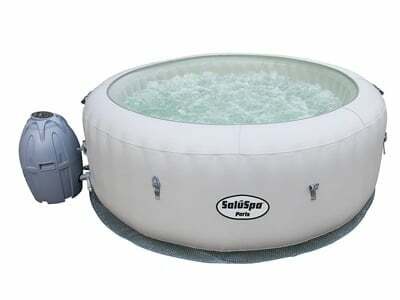 Among their latest offering is the SaluSpa Palm Springs, a circular inflatable hot tub that can seat up to six people. This unit also screams out premium because of its leather texture and mellow color palette; not to mention its numerous extra features. It can also be easily setup outdoors, or even indoors, without the need for any tools. The Palm Springs also has a slightly larger diameter and height than most of its rivals in the segment. The SaluSpa holds 242gal of water. As such, it can hold more water which is great if you are the type who wants to submerge yourself deeper in the portable hot tub. Despite its load capacity, you can rest assured that it’s still comfortable and structurally sound thanks to its very rigid i-beam construction. 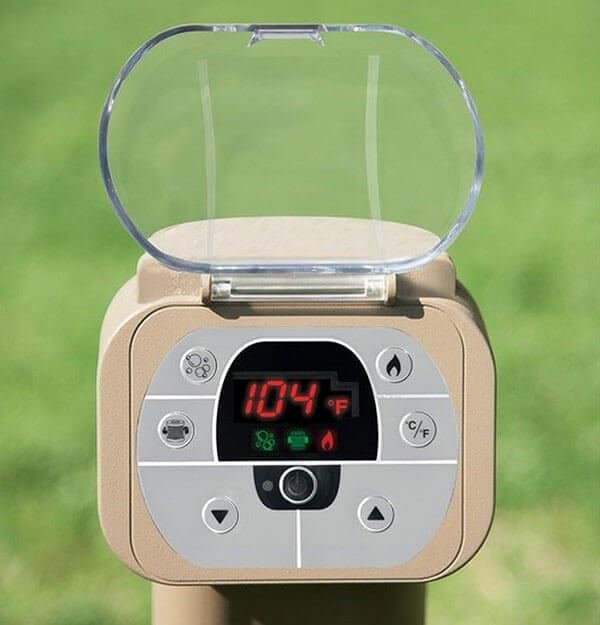 Furthermore, this model also has a very interactive digital panel that lets you set your desired temperature (up to 104 degrees Fahrenheit), as well as its other features. It also has a strategically placed air jets that can give you a soothing massage to relieve your body’s aches and pains. Maintenance is also not an issue for this incredible tub as it has its own chemical floater and a replaceable filter cartridge. The unit also comes equipped with an insulated cover to help retain the ideal temperature longer. This said feature also prevents your toddlers from unwittingly dipping themselves in the hot tub unsupervised. You will also appreciate that they included a DVD guide with the hot tub set, aside from the usual user manual. This instructional material can help you install the unit correctly and up to speed. There are also tons of info including hot tub maintenance and maintaining the chemical balance in the water. Coleman has a wide range of that covers much of the market’s demands. 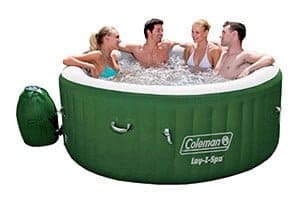 The smaller version of the Coleman Lay-Z Spa is the miniature Coleman SaluSpa, a mobile spa that can seat up to four people. With a 71-inches diameter when fully inflated, this one is much smaller than its rivals in the under $500 category. Its small design is perfect for, well, small spaces too. This in itself can be a boon and a bane. Smaller means you can fit it even in tight places in your property such as a shack. However, that also means less legroom for the bathers. If size is not an issue for you, it’s easy to fall in love with this tub. The tub’s flooring is padded which gives it superior comfort. The walls of the hot tub are also very firm and provide incredible support to your back when you are lying on your back. It also has 60 air jets that can give you a decent spa massage experience. However, this is fewer and slightly underpowered than what larger spas can provide. The Coleman SaluSpa also has an interactive panel that oversees much of its operation. Its heating unit can warm the water at a rate of 3 degrees Fahrenheit so it will take about less than a day for it to reach its maximum temperature of 104 degrees. The only downside is that it uses a timer mechanism, which you have to constantly adjust every time you use it. Furthermore, this one has two rigid handles which can help you move or relocate this empty unit with ease. Thus, it’s more mobile because of the fact that it’s slightly lighter than a full hot tub. One of the most affordable products on this list is the SaluSpa Miami Airjet. 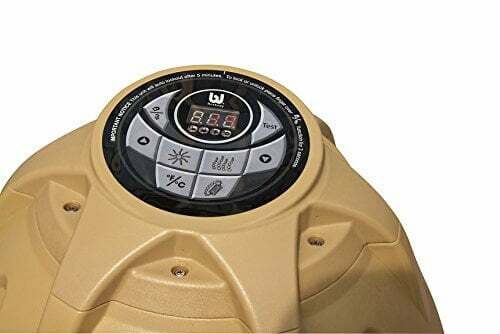 For an under $400 outdoor inflatable hot tub, this product offers a lot of bang for your buck because of its numerous features. It does everything right from its casual no-frills design to its overall functionality. The SaluSpa Miami is small so it inflates fast. When fully inflated, the hot tub has a diameter of 71-inches, has a height of 26-inches and can hold 177 gallons of water. It’s easy to set up whether outdoors or indoors and doesn’t take an hour for it to completely fill it with air. Loading it up with water also takes just a few minutes. The tub is also very rigid thanks to its polyester mesh core and laminated PVC layers. These materials are very durable and do not wrinkle easily. The inside is made of tough, puncture-resistant design. Adding to its sturdiness are the tubs walls which have an I-bean structure which allows it to be durable and puncture resistant. With these features, you can sit on the tub’s sides without worrying that it will bend or buckle under your weight. Setting it up is also just a breeze and doesn’t require any additional tools or the help of professional installers. You can find everything you need on how to install it through the included DVD which provides a lot of information about maintenance and how to put up the unit. However, the prevailing downside of this unit is that it doesn’t have the pressurized jet massage that premium jacuzzis offer. Instead, it releases bubbles on the side of the pool to create a semi-therapeutic water massage; which is not bad, but also not that great. On the positive note, it doesn’t consume as much electricity as the deluxe spa units. You get to have the hot tub experience at a fraction of a cost. 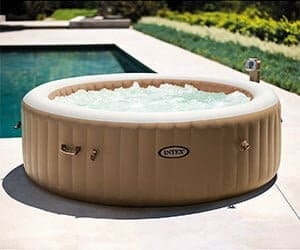 At under $500, this tub is a great purchase for those who are getting their first, if not even the best inflatable hot tub in that situation. 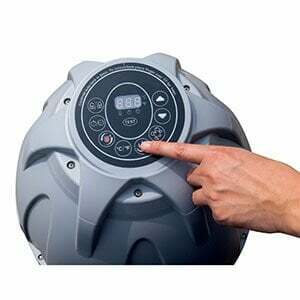 With its digital control panel is located within your reach, you can easily regulate the temperature without having to get out of the hot tub. It can automatically be started and timed to a certain duration for it to automatically stop. It’s a pretty convenient feature so your sore muscles will be pampered without interference. Plus, supplies include a filtration system and chemical floater that will guarantee you a safe and clean spa experience. Correct usage of these inclusions can be found in the instructional DVD. 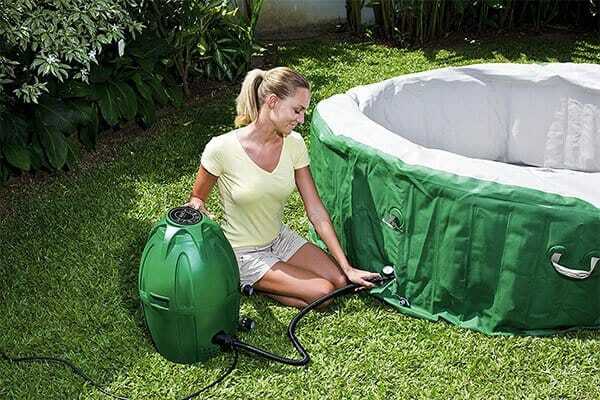 Everything you need to set up this inflatable hot tub is found in its package. The tub has Rapid Heating System that will allow your water temperature to increase rapidly. This feature makes the tub ready, not just quickly, but also safely. This tub can be heated up to a temperature of 104 degrees Fahrenheit. 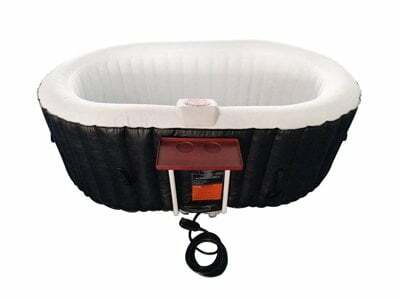 If you desire to preserve the temperature of the water inside the inflatable hot tub for an adequate amount of time, this tub comes with a cover to maintain optimal water temperature. This Rapid Heating System is pretty convenient for when you want to feel extra relaxed. It’s the priciest and only tub on the list that is above $500. However, you definitely have no reason to conclude that the SaluSpa Siena Airjet is a rip-off. In fact, we think that it’s one of the best-valued spas in the market. Far from the circular and square shaped models in the market, this tub has a unique boat-like shape. It also only seats two people instead of the usual four to six. Why, you ask? It’s to give way to two of the things it excels at comfort and luxury. The Siena AirJet offers a unique sitting position. It’s got that audacious 98-inches by 58-inches area which is more than plenty to keep your whole body submerge plus that of another person. It’s perfect for couples who want an intimate bath together or for those who want to dip in warm waters alone. The unit also boasts a Salu Massage System with 120 all-surrounding Air Jets that creates plenty of bubbles to massage your muscles as you unwind in its warm waters (up to 104 degrees Fahrenheit). It’s by far the strongest pressurized water we had and needless to say the most enjoyable. The tub also includes a beverage table which is incredible if you don’t want to stay in the hot tub for a long time. Moreover, the walls of the hot tub are much thicker and sturdier than many of its rivals. It also has cushioned flooring which makes it very comfortable to sit on. The heater also is very quiet and is efficient in maintaining your preferred temperature. Overall, it’s definitely a must buy for couples who enjoy bathing in the hot tub together. Adding to the 4-person capacity is the GoPlus Outdoor. With its features and superb quality, this inflatable hot tub is a sure hit. This tub features a user-friendly panel, located along the corner of the tub, which is easy to operate. Once the Goplus System is activated, the 130 high-powered soothing bubble jets will be stimulated along with the relaxing heated water. In addition, maintenance won’t be a problem because its filter cartridge can be easily replaced allowing clean water all the time. For a retained soft water in the spa, suspended crystals are kept in the filter cartridge. This tub is designed for your convenience and ease of transport. When you’re done using it, it can be easily put away by folding it and grabbing the handles. With its built-in Hard Water Treatment System, the heated water produced becomes gentle in the skin, clothes, and basically, everything that the treated water touches. This avoids the build-up of hard water, which can lead to a poor tub life. Through this system, your personal temperature preference will be met. The exterior walls of the inflatable hot tub are made of fabric-coated material and insulated ground cloth. It also comes with an insulated cover that is responsible for better heating and safety. These keep the tub’s high thermal retention. Among the remarkable spas is this one from Lifesmart. This one will definitely not disappoint because of its specifications and total relaxation it gives you in return. The LifeSmart Simplicity Plug and Play Hot Tub is worth every penny because of the great features that come along with it. It comes with Balboa topside controls, adjustable graphite jets, and a filter. Improve your spa experience with its 12-volt light with interchangeable mood lens caps. It’s called “Plug and Play” for a reason. That said, you are bound to have the time of your life without hassle because you can simply fill it up, and plug it in. Sit back and relax with its deep bucket seating design that’s barrier-free. It is designed so as to fit 4 people. This also features top-side air valves which give you the opportunity to control the combination of air and water in the tub. What makes this hot tub exceptional is that it is constructed using high-quality material, so its durability is not a concern. This hot tub might not be as handy as its competitors but it has a highly indestructible structure featuring its Sandstone Rock Solid shell. Among its rivals, only LifeSmart uses EcoSmart Technology which is a very good energy management system. Each LifeSmart Simplicity spa has this feature. This makes the tub consume less energy, without affecting its performance. 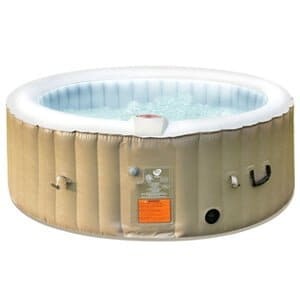 In this section, we have included the most popular choices for inflatable hot tubs for every first-time buyer looking for a model that fits 6 persons. Under each product, all the important details are listed as well and this is to help you decide if a certain product will fit your needs and wants. The Intex Pure Spa 6-Person Hot Tub 28409e is one of the models that come in a sleek and appealing design. In fact, many first-time buyers choose to buy this because of its overall appearance and style. Also, this 6 person model is very easy to set up and assemble. It would only take you 15 to 20 minutes to inflate and deflate the whole hot tub. Moreover, it is very compact and mobile. Along with its carry bag, you can bring this anywhere with you and your family. It features 170 bubble jets which are quite effective in providing a massage. Also, it is made durable since the materials used in this are subjected to Fiber-Tech technology. Plus, it is also puncture-resistant. 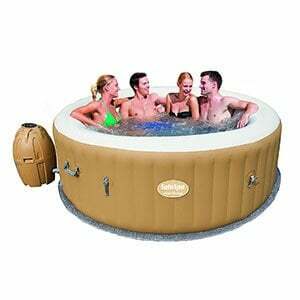 For a price that falls below $500, The Intex Pure Spa 6-Person Heated Hot Tub 28409e is a quality product of inflatable 6 person hot tubs. This Intex PureSpa 6 Person Bubble Jet Hot Tub model is quite similar to the Intex PureSpa 28409e model. The differences between the two lie in the appearance, massage methods, price, and durability. The appearance of this Intex PureSpa model is quite similar to the previous model. But, this one comes in a much more vibrant color which is why many prefer this. However, it only features 140 bubble-jets. And this number is usually seen in most 2 to 4-person hot tub packages. Hence, the massage methods are quite different in comparison to the other model. As for durability, this model also uses Fiber-Tech technology. But it is not puncture-resistant. Even so, it can still provide a decent amount of service to you in terms of its durability. And because of this, the price is much cheaper than the other model mentioned above. 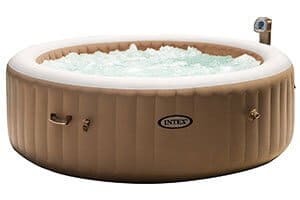 If you are looking for a much more inexpensive counterpart of the CostWay Bubble Massage Spa Hot Tub 6 Person Relaxing Outdoor set, then this Intex PureSpa model might be the best 6-person hot tub for you! For a price that falls under $600, you could already enjoy and relax with this very roomy tub. But while it is not very cheap in comparison to most entry-level models, its quality and durability speak for its value. In addition, it comes with 140 bubble-jets that are installed in the surrounding walls of the hot tub. Accordingly, this positioning does not largely affect the heated water. This Paris AirJet 6 person hot tub from SaluSpa is quite unique and not because of its shape or form. Apparently, the SaluSpa Paris AirJet features a set of LED lights that can provide you with a show performance when in use. Although other users are not really a fan of this feature, others find this very useful for small parties and get-together occasions. Aside from this feature, the said model is very easy to set-up and install. It would only take you 15 to 30 minutes to finish the whole process. Also, this is very ideal for young adults and teens who just want to relax after experiencing a hellish week at school. You can purchase this set for a price that falls below $450 and it comes with free shipping too! If you are looking for a model that can accommodate 6 persons, then one of the first things you must consider is the size and dimension. Keep in mind that any 4-person tub would normally have a dimension of 71 x 71 x 28 inches. Hence, if you are buying for 6 persons, the dimension rating must be larger or higher than this. Also, you need to regard the inner dimension rating too. This means you will need to subtract the inner measurements from the outer dimensions to get the total area of the space that you can use in it. The water capacity is somewhat related to the size and dimension factors. This is because the larger the water capacity is, it only means that the larger the area that you can use inside. Most 2- to 4-person hot tubs would normally have a total water capacity of 250 to 270 gallons. Hence, you must look for a volume that is higher than this. Are you planning to buy an inflatable hot tub but wondering if it will fit in your house? Apparently, this is one of the things that most interested buyers worry about. It is only fitting since most products today are quite big and roomy. But you would be happy to know there are still portable hot tub sets that are perfect for small spaces. And if you are looking for a small one, this section may help you in your search! The MSPA Lite Alpine Square Relaxation and Hydrotherapy Outdoor Spa is a very mobile and a rather small inflatable hot tub. The overall dimension of this tub is rated at 68 x 68 x 27 inches which makes it very perfect for people who reside in a limited and small space. As for the functionality, this MSPA model features 106 air jets that offer effective massage system options for the users. Also, you can experience real relaxation due to its whisper quiet operation. This small blow-up tub from ALEKO is perfect for 1 to 2 persons. But it is much more ideal for eating 1 person only. Hence, it is perfect for individuals who live independently in their small pads. The quality is pretty decent as it already features a drink tray, 600W bubbler, and 900W heater unit. Also, it would take approximately 3 hours to heat the water. Hence, you could easily and quickly enjoy your relaxing hot water bath. 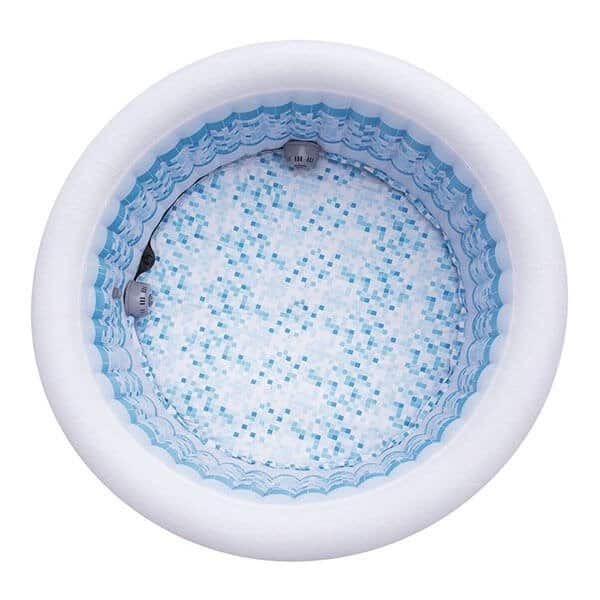 This mini inflatable bathtub is quite simple and nothing like the other inflatables listed in this guide. Apparently, the only function that it provides is that it can contain hot water but it cannot retain or produce heat. You can just fill it up using a garden hose and refresh yourself when it's hot outside. It can actually accommodate 1 to 2 persons but this is much more perfect for seating 1 person only. Also, it is very mobile and compact. In fact, you can fold this inflatable when not in use. If you are looking for a small inflatable spa, then the first things to consider are the size and dimension of the hot tub. Depending on the size of your property, you must carefully check whether the chosen model can fit in your house. Usually, the most applicable dimension rating for small spaces would range from 65 x 28 inches up to 75 x 28 inches. The features and functions are also important factors that you must consider before purchasing. Although some provide the smartest features, it will still depend on your personal preferences. And regardless of whatever function or feature that you would like in your chosen product, just make sure that you consider each aspect. Surely, you do not want to encounter a few bumps and inconveniences as you use the tub. Let’s face it. They are not really cheap. Whatever brand or type you choose, it would still cost you hundreds of dollars. But even so, there are still some that you can consider inexpensive in comparison to other inflatable hot tub deals. So if you are looking for an inexpensive inflatable hot tub and you want to make the most of your budget, then this guide is perfect for you! Everyone has their own struggles in looking for the best fit for them and some are lucky enough to find them. During the entire process, they learn a lot about these portable hot tub models that they should have otherwise known beforehand. We decided to make things easier for you and give you a heads up! In this section, we have included the 3 most cost-effective and still very functional models. Along with the brands and types, we also looked into the important details and reviews about them. Because we already reviewed each of these models above, we're just going to link to them. If you click on any, you'll be taken to the review. If you are looking for the cheapest hot tub deals, then the number one factor that you must consider is your budget and the price of the product you pick. Sorry to pop your bubble but as mentioned, most models are not really cheap. In fact, you need to shell out a few hundred to thousand dollars just to have your very own inflatable and portable hot tub. So when a certain hot tub package is said to be inexpensive and affordable, that means the price is rated below $500. Keep in mind that high-end types of blow-up hot tubs normally have prices that range from $600 to $1500. Accordingly, you have to be practical as well if you want to get the cheapest inflatable hot tub deals. And to be practical here means that you need to consider the package inclusions and shipping costs. Some sets and deals would have a complete set of accessories and tools already. Also, there are packages that would include free shipping costs too. And you may want to check these out if you want to utilize your budget smartly. An inflatable hot tub can change your life a lot. Owning one gives you the chance to pamper yourself and bathe in therapeutic waters right in your own residence. It’s also a great way for the family or friends to enjoy a break or relaxation together. Not to mention the health benefits it has on one’s body. 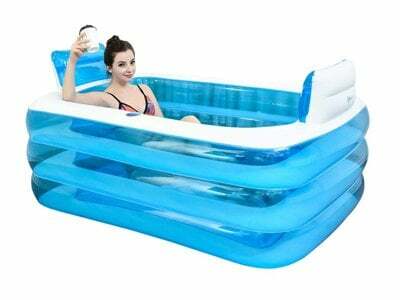 The first thing you should ask yourself is do you have enough space in your residence for the blow-up tub? It’s great if you have a huge backyard or an empty room in the house as you can easily install this item. If you don't have much space, consider a 2 person inflatable hot tub. How many of your friends/family will be using the hot tub? However, if you live in a smaller abode like an apartment and still want to have one you need to take note of its dimension. As such, envision first where you want it installed. Measure the available space and take note of it. When you are searching for a compatible hot tub unit it should fit on that space when the later is fully inflated. If not, you may need to search for something smaller. Some hot tubs have several temperature restrictions. This means the manufacturer doesn’t want you to use it under extremely cold weather conditions. The reason being the hot tub can’t heat itself fast enough to negate the colder elements. In which case, it depicts the purpose of being a “hot” tub. A panel is great, but you need to watch out for cold weather too. If you live in regions that have extremely cold weather, you may want to check out first at what temperature the tub can function properly. Many of the inflatable spas can perform at around 40 degrees Fahrenheit, while others need the weather to be slightly higher. Check also if the tub includes other items other than the main unit before you buy an inflatable hot tub. Some manufacturers include test strips, filter cartridges, carry bags, etc. in their package to help you keep the water clean. Many of these items are good to keep you get started in your hot tub experience. Test strips, for example, can tell you if the water quality is at par with the standards and whether you need water filtration. Also, they can also cost a few extra dollars. If you are a smart buyer, you can also factor in if the tub is giving you enough value for what you are paying based on these inclusions. More than relaxation and pamper time for yourself, inflatable spas possess lots of benefits and purposes. It does not just affect your wellness, but also your home too. Economically speaking, not everyone gets to experience having a hard hot tub or Jacuzzi inside their homes. Opting for a blow-up jacuzzi is a far more affordable option compared to regular hot tubs which cost thousands of dollars. The best inflatable hot tub to buy can be cheap, but should not fall short in its quality and features. In addition, having an expansive one of your own makes you want to go to your local spa lesser. Who would want to go outside when you can achieve total relaxation in the comfort of your own home? One of the major perks of having your own motile hot tub is its mobility and easy installation. Unlike the regular ones, having a portable spa does not consume a permanent space because you can easily wrap it up and set aside. You can have it stored out in your backyard on a sunny day, or pack it up and take it inside during winter. And how can we forget taking this fun little amusement on vacations and weekend getaways? I mean, inflatable hot tubs can really be your best friend, so you should find and buy one. An expandable spa can make the whole family, depending on its capacity, come together. What’s more relaxing than seeing your family enjoy the hot bubbles, too? It can also be shared with friends, of course. A good old bottle of wine and great company, what else could go wrong? If you’ve been experiencing back pains lately, spending a few minutes in hot water can solve that problem. The soothing power lies in the hot water and jet bubbles which help massage and ease your back muscles. These release pressure on your joints and muscles [R], resulting in a rejuvenated and refreshed body! On the flipside, inflatable hot tubs also have some disadvantages you can’t avoid. Even the best portable hot tub can have its downsides, too. Most products do not usually come with built-in seating when you buy them. So, when you say portable hot tubs, it does not automatically scream comfortability. Bucket seats for people aren’t always available, unlike a regular one. Sometimes, the closest you’ll get is a cushioned seat at the bottom of the tub. That's why you might want to check out our guide on blow up hot tubs that have seats. They take quite some time to heat up depending on the water heater. This means you have to wait for hours just to reach your preferred temperature because it usually takes about an hour for a 2 to 3°F temperature increase if the one you bought has a decent water heater. Make sure to never exceed temperatures of 104°F. Because it takes a long time to heat, it’s expected to consume more energy. However, that’s only one of the reasons why inflatable spas might not be an energy-saver. It also depends on how often, and when you’re using it and whether you use a small one or one for 6 persons. When used outside, they are prone to lose heat faster compared to inside use. Weather conditions surrounding it is also a factor. The maintenance should be a breeze, right? Keep the filters in good condition by removing and rinsing them every few days or so, depending on how much it has been used. Another downside is the location filters. Some models place the filters inside the heater or pump for easy access, while others put it along the bottom inner portion of the tub. This makes cleaning and changing it a more demanding task. Inflatable hot tubs need a little bit of TLC, too. Treating your spa just like any ordinary appliance is very important. You want to lengthen its life, so keep track of these helpful tips. Models differ from one to another. It is best to read the installment instructions first for a smooth assembly of the equipment. Sometimes, what makes the best model outstanding is how YOU construct it. If it comes with an installation DVD, you might also need to watch it. A lot of YouTube videos related to this matter are posted online, too. But, if all else fails, you can always turn to their customer service. It is important to secure a socket that is situated enough to get you a safe spa experience. It should be far enough that splashes won’t get to the socket. 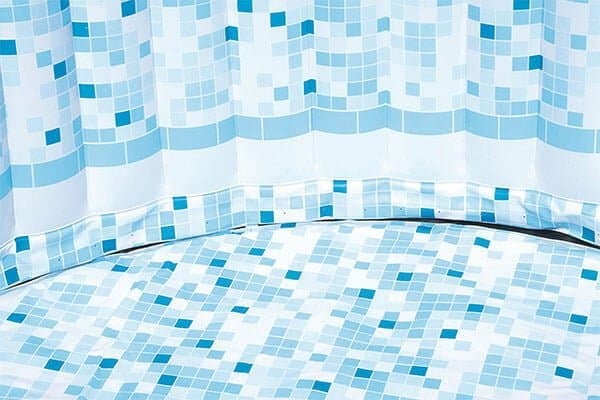 We don’t want short circuits happening in your homes, especially while you’re in the tub. Opting to get an extension wire isn’t advisable. As much as you want to warm up on cold weather, most models are not built for environments with cold temperatures because this causes the hot tub’s pump mechanism to freeze which could eventually damage it. When not in use, make sure to deflate and keep it away, or transfer it to a place where it’s safe to store as it is. Start your top inflatable jacuzzi experience by finding a flat surface to set it up. This way, it holds its weight and the people inside it uniformly. A lot of inflatable hot tubs come with insulation liner so you can put it underneath the tub before pumping air into it, so you might want to check for it first. Upgrade your home-based spa experience by purchasing some accessories. Customize it with fun add-ons like glass holders, headrests, benches, extra filter cartridges, and a lot more. These accessories are not included in a basic blow up hot tub set, so you might want to splurge a little more. Because nothing screams “best inflatable hot tub” quite like the one with your personal touch on it. Adding a salt water system creates a completely new and more healthy experience as well! To know more about portable hot tubs, here are some questions to serve as your guide. In a flat surface, unbox the items. Connect the tub to the pump/heater mechanism, plug it to a socket, and inflate. Once inflated, fill it with water. Test the tub’s water by doing a shock dose treatment for a day. Each model is different. Some retailers include the water treatment starter kit, so reading the manual about this information is the best thing to do. Knowing how to use the chemical dosage for your hot tub water is a better option than replacing it every day. If possible, you should change it every month. Greenish and murky water is also a clear sign it needs to be changed. This means algae are present and it is not safe anymore. If you don't change and properly maintain your water, nasty bacteria such as legionella can flourish in your hot tub. This instance is unavoidable even with the best, so patch up the hole using the repair kit that comes with it. Yes, you can use them in ambient air temperatures that are below freezing if its pump is powerful enough. Testing has proven that you can use most models in winter if you insulate the pump to keep water in it from freezing. If the water in your pump freezes the pump and pipes aren't strong enough, it might cause damage to these parts. Most inflatable hot tubs’ prices range from $300 to $1000. Refurbished tubs are cheaper than that, while high-end ones cost more than $1400. Regular hot tubs will cost you as much as $20,000. If you have a high-quality one that you take good care of, it can last as long as 10-20 years or more. Its lifetime mainly depends on the product quality and how well you take care of it. If you maintain it well, it will last more than a decade. Older children can safely be in it under adult supervision. Blow-up hot tubs are a no-go for babies, however. Make sure to read these safety tips if there are children in your household or direct neighborhood. Even the best inflatable hot tub can't prevent an accident. Yes, you can put it indoor and you even should put it inside your house if temperatures in your climate zone get below freezing in winter. However, you have to handle it carefully to avoid water damage and also make sure the room is well-ventilated. This depends on several factors, such as how much you pay per kilowatt hour, air temperature and how hot you want the water to be. Most recent models would cost around $23 per month if used daily. They cost between $300 and $600 including shipping. How much exactly, of course, depends on the model you choose.